A reboot of the Bourne franchise despite the telltale absence of the previous film’s main drivers, namely star Matt Damon and director Paul Greengrass, whose gritty, documentary-style worked as a game changer in terms of modern action movies, forcing even the Bond films to step up a gear. Tony Gilroy – script writer on the previous three films – helms this scattergun effort with occasional aplomb, particularly during two masterfully tense shootout sequences, but the crow-barring of extraneous references to The Bourne Ultimatum is confusing and pointless, before resorting to a rather perfunctory cat and mouse thriller. In fairness to Gilroy, this shares just as little with Robert Ludlum’s books as the Greengrass sequels, but it never achieves the same excitement. In a story supposedly running concurrently with events outlined in Ultimatum, an exasperated Edward Norton heads a secretive governmental division employed to settle a mad scientific rehabilitation program pumping superhuman steroids into ex-military men, changing their genetic makeup in the process. 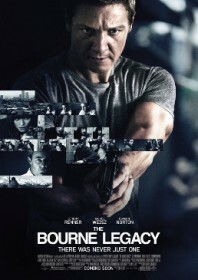 As the Feds close in, army lab rat Aaron Cross (Renner) escapes a drone attack while in reconnaissance in Alaska and hits the road on a covert quest for more drugs, taking chemical researcher Rachel Weisz along for the ride after a crazed gunman lifts the lid on the government’s top secret experiments. As Cross runs out of meds, the duo board a flight to the Philippines where things get really silly, including a left-field plot contrivance involving a Thai hitman in a rather desperate set-up for the final showdown. References to drone attacks, biochemistry and the power of America’s pharmaceutical companies suggest good fodder for topical examination, particularly judging by the sort of political intrigue we have come to expect from these films, but this is a far less nuanced and subtle sequel, and at its most basest elements it is much closer to something quite trashy like Universal Solider. And Cross is a less endearing character than the vulnerable Jason Bourne, forced to desperately search his blank memory for clues to his own motives and loyalties. Bourne also acquires his fighting skills organically, as opposed to Cross’ artificial super strength which arrives in pill form. This is not the fault of Renner, of course, who is great in the role, playing the terse, macho counterbalance to Damon’s baby face. However, Gilroy’s new direction for the franchise may flirt with the Bourne themes but neglects the previous films’ pulse, imagination and heart.